Organizations are under a great amount of stress to deliver outstanding omnichannel interactions to their customers. Creating a positive customer experience in a mobile app or online is at the core of increasing future revenues, improving customer satisfaction, and maintaining strong customer relationships to retain loyal customers. Perhaps more importantly, customer expectations for web and mobile experience are at an all-time high. With so many options available to customers, it is integral to an organization’s success that it delivers strong customer experiences. This Total Economic Impact (TEI) analysis has been prepared exclusively for you based on your inputs. 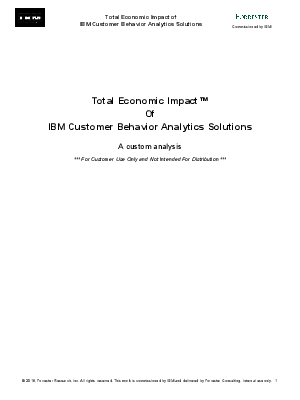 The analysis provides a high-level estimate of the impact of implementing IBM customer behavior analytics solutions.